May is National Bike Month! Top 7 Benefits of Cycling. Are you looking for a little motivation before you hop back on your bike? If so, we’ve got you covered. The following 7 benefits of bicycling are just a few of the important rewards that cycling offers. Cycling Is Great for Your Ticker: Cycling improves overall cardiovascular health. And did you know that cycling even reduces your risk of contracting coronary heart disease? Your Coordination, Balance and Flexibility Are Improved: You have to coordinate the movement of your arms, upper and lower legs and your core while cycling. your metabolism, burns fat and calories, and helps shrink your waistline. Cycling Builds Muscle: Want to tighten up your booty? Embarrassed by your “chicken legs”? Cycling can help. Bicycling on a regular basis builds muscle and burns fat, leading to the next important cycling benefit. Cycling Is Great for Losing Weight and Tightening Your Tummy: Your legs do a lot of work when you ride your bike. But your core also benefits a great deal. Cycling ramps up your metabolism, burns fat and calories, and helps shrink your waistline. Cycling Is an Excellent Low-Impact Exercise: Cycling is a rhythmic aerobic and strength training exercise that provides benefits of physical activity, without the negative pounding and stress that can cause aches and pains in your joints. Cycling Can Boost Your Emotional and Mental States: The US National Library of Medicine studied the effect of bicycling on mental function. 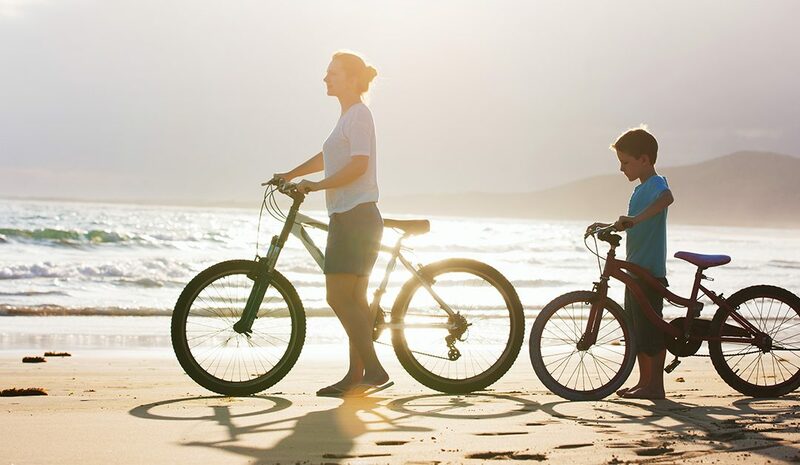 They found increases in positive emotional states and brainwave activity during and after a bicycle ride. Cycling Helps You Live Longer: The dangers of a sedentary lifestyle are well-known. Even after considering possible cycling injuries, individuals who consistently ride their bikes show a much longer average lifespan and those who do not. Bike to Work Day was originated by the League of American Bicyclists in 1956 and is a part of Bike-to-Work Week, which is in turn part of National Bike Month. National, regional, and local bicycle advocacy groups encourage people to try bicycle commuting as a healthy and safe alternative to driving by providing route information and tips for new bicycle commuters. The American Medical Association has endorsed Bike to Work Day as part of its push to encourage active transportation. Nationwide, on Bike to Work Day, a wide variety of bicycle-related events are organized. The event is supported by many organizations, from local bike shops and restaurants to municipalities and transit authorities.